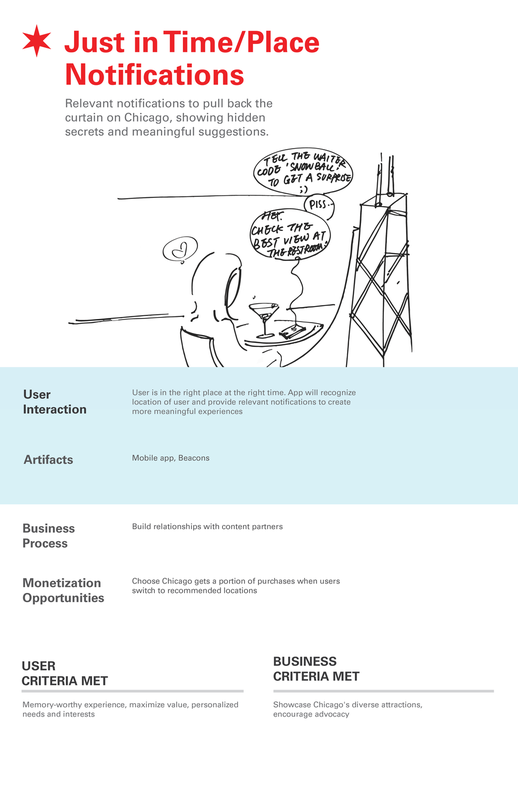 In Anijo Mathew's Experience Modeling class at IIT's Institute of Design our client, Choose Chicago, approached us to help them increase International visitors to Chicago by developing a new user experience and strategy for Choose Chicago. Through our research of their physical space, online presence, existing offerings and experiences we felt that to showcase Chicago, you needed a co-conspirator, not a tour guide. The greatest concierges Choose Chicago had were your co-conspirator already, we worked to enable the rest of the staff through training, the digital experience and tone. The app prompted users to experience Chicago in unique and relevant ways. The notifications are specific to location, time and interests. If a user is enjoying drinks at the 95th floor of the John Hancock Building they would get a notification like this before leaving. We developed 5 opportunities for Choose Chicago to alter their experience. Instead of maintaining a permanent visitor information center, we wanted to highlight Chicago's diverse amenities by setting up temporary or mobile visitor information centers. We also wanted to make users feel like they are on an adventure using secret digital markers and rewards as they explore Chicago. We want to show them beautiful parts of the city the users would have otherwise walked by. A co-conspirator app would also provide notifications that are thoughtful in terms of location and time. As users explored the city we also wanted to make finding information easier with localized information and suggestions. Lastly, we felt that visitors to Chicago were the greatest advocates for the experience, so we built in rewards for advocacy. We generated an extensive list of locations users might see as suggestions as they are searching for places to visit. We wanted to move away from traditional top 10 lists exclusively that try and make Chicago one dimensional. They could be a starting place, but each visit to Chicago should be unique. This project was incredibly successful because it created a direction for Choose Chicago that allowed them to make easy changes quickly as per their request, but also have some far reaching goals that were consistent in language and direction. We presented our concept as a skit. 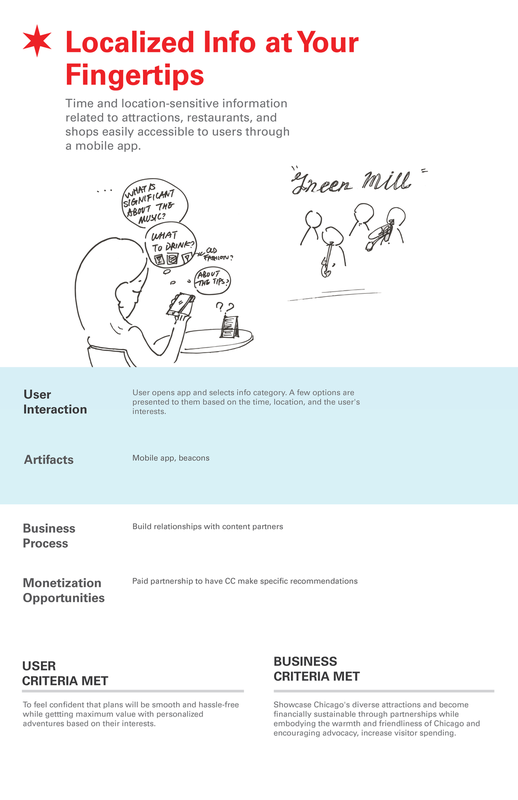 We had a narrator walk through the journey of a user and a personification of the application. It was playful and effectively communicated the tone we had created.